Betty Cuthbert was a shy, humble lady, but when she donned her spikes she packed energy, passion and medal-winning speed. She was our first ‘Golden Girl.’ She was just 18 when she burst from anonymity. The skinny West Australian captured the nation, winning three gold medals at the 1956 Olympic Games in Melbourne. Her success was inspirational for millions. Television was introduced just in time for the “Friendly Games’ and they were telecast in ‘glorious’ black and white. Sydney viewers watched the Games, a day after Melbourne. It was the ideal platform for a new Australian legend to be unveiled. Before Melbourne, Betty was an unknown. Her own expectations were not high. Betty bought tickets to be at the Olympics as a spectator. After her selection she gifted the ticket to her brother. 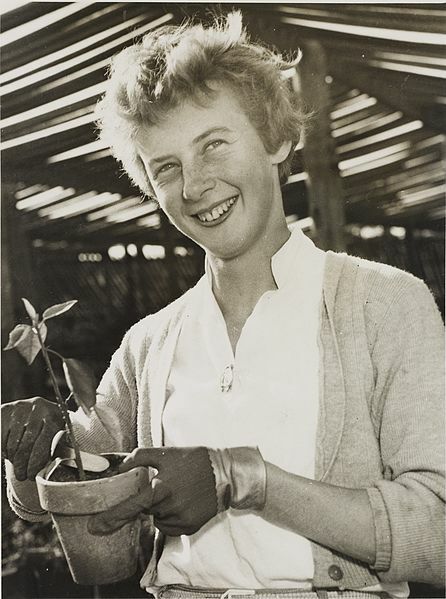 Betty Cuthbert was the first Australian athlete, male or female, to win three gold medals at a single Games. I had the thrill of interviewing Betty at the peak of her career. We sat in my car to avoid crowd noise and I learned then how humble she was. We met again when I visited with her and her friends in Perth. She talked openly about her faith. “My salvation was a free gift. I didn’t have to work for it, and it’s better than any gold medal that I’ve ever won,” she said. Among the quotes attributed to her, Betty focused on family and growing up. "My parents always encouraged me and I had a good home life. We were always taught to respect things and other people. It's so different today, because children are just not taught the right way,” she said. She was born in Merrylands, New South Wales, 20 April, 1938. Her twin sister was Marie (Midge0 and her brother John. Betty felt the most alive when running. She often spoke about the freedom she felt. Her dad owned a plant nursery and friends recall her delight when running through the rows of plants feeling that freedom of flight. “It's funny looking back at everything," she said. "I was never fanatical about running, never had any heroes or anything. It all just happened." She may not have been a fanatical athlete but Betty Cuthbert was obviously gifted. At Ermington Public School she won Best Girl Athlete. During her time at MacArthur Girls High School she met June Ferguson who coached, nurtured and encouraged her. With the advice of Ferguson, Betty joined the Western Suburbs Athletic Club. She was diagnosed with multiple sclerosis in the 1970s. Her fighting spirit came to the fore. She was actively involved with the disease. She supported research and the function of the Multiple Sclerosis Society. In 1997 one of my favourite authors Peter FitzSimmons had an extended interview with Betty. In the article published by the Sydney Morning Herald they talked about her MS battle. I was touched by this: “Strangely, talking about her condition like this, and obviously now grievously afflicted by it physically, there seems no trace of bitterness in her, no agony that such a healthy life should have come under such attack for no apparent reason. What gives? "Because I knew the truth - God gave it to me for a reason - that's all I used to think. I never, ever, once said, 'Why me?' "
And what was her God's reason? Her recent passing sparked warm reports from around the world. Richard Goldstein in the New York Times recalled: “When the Olympics returned to Australia with the Sydney Games in 2000, Cuthbert was in the public eye once more. She carried the torch around the track in the opening ceremony, her wheelchair pushed by her countrywoman Raelene Boyle, a three-time Olympic silver medalist in the sprints. The torch was ultimately passed to the Aboriginal sprinter Cathy Freeman, who lit the cauldron. Freeman went on to win the women’s 400 meters, 36 years after Cuthbert had captured that event in Tokyo.” A poignant memory! In Lismore, 1985 the preacher was Rev Gordon Moyes from Sydney’s Wesley Mission and Betty Cuthbert responded and was ‘born again.’ Betty recalled that day. “I always thought I was a Christian but in 1985 the speaker at a rally invited people to publicly declare their faith in Jesus Christ. When he said, "there are private practicing Christians here,"
I was compelled to go forward and prayed to receive Jesus. Now I try to share the good news of Jesus with as many people as possible” (Betty Cuthbert, thegoal.com) Months later Betty and her close friend and carer Rhona Gillam joined Rhema Family Church, Perth where Australian tennis icon Margaret Court is pastor. Rhonda Gillam holds a special place in the Betty Cuthbert story. In a story published by The Australian they referred to ‘The gift of Rhonda Gillam”. Rhonda and her husband Keith were constantly watching and assisting Betty during her medical struggles. Her small apartment displayed no medals or trophies. It was simple, humble as she was. She was Elizabeth Alyse Cuthbert, AM, MBE but she won our hearts as Betty Cuthbert, our extraordinary Golden Girl.